The TouchPad is no more, but what next for HP's PC business? "Is it me, or is the tech industry trying to cram all of this year's news into a single week?" our columnist Gary Marshall asked last Friday. It certainly seems that way: on Wednesday Steve Jobs resigned as CEO of Apple, and a few days previously the world's biggest PC maker decided to stop making phones and tablets and sell off its PC division. Tim Cook takes over - the man that has effectively been running Apple for ages anyway. Does the following description remind you of anyone? "He wears blue jeans and trainers. He's a workaholic. He's incredibly intelligent, doesn't miss a detail, and can destroy you with a single question. He's had a brush with mortality. He's intensely private. He eats, sleeps and breathes Apple." It sounds like Steve Jobs, but we're describing Tim Cook. "With Cook running the ship and Jonathan Ive taking care of design, Steve Jobs is leaving Apple in very capable hands." Despite Cook's competence, Jobs' departure is the end of an era, Marshall writes: the industry Jobs helped create has grown up, and grown dull. It's "a place for patent lawyers, not product visionaries - a place for Olly Murs, not Exile on Main Street." Jobs isn't the only one getting out of the computer business. HP is too. The world's biggest PC manufacturer has canned its tablet and smartphone divisions, with the price of the HP TouchPad plummeting to £89. Inevitably there was a rush and stocks sold out almost instantly; HP promises that there's more coming. 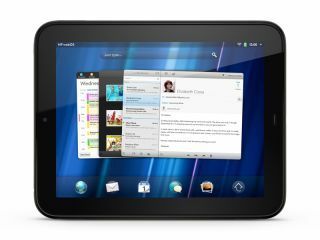 The end of the TouchPad and Palm smartphones means that WebOS, HP's own and rather attractive operating system, is dead. "WebOS is not dead," says HP vice-president Stephen Dewitt. "It's just having a nap. A very, very long nap." Okay, we made that last bit up. But its long-term future doesn't look good. "The whole world isn't just about tablets and phones," Dewitt said. "There are going to be appliances of so many different sizes and shapes in the future that are going to require a human interface for data". So there you go. WebOS may be coming to a fridge near you. That's much more exciting than tablets, isn't it? Not only is HP getting shot of its mobile devices, but it intends to get rid of its PC business too. Why? Allow us to explain: "PCs aren't going away, but the business of making them has changed dramatically... HP wasn't losing money on PCs, but it wasn't making enough money." It's particularly tough at the moment, "when stockbrokers are hurling themselves from high buildings and most people have stopped spending money on luxuries". HP, like IBM before it, has decided to focus on selling services to businesses, not making computers with single-digit profit margins. However, HP yesterday moved to quash a lot of speculation over the move, saying it hadn't actually said it was getting out of the PC business. Which it actually did say. "Let me be absolutely clear in saying that at no stage has HP said it is quitting the PC business," explained CEO Leo Apotheker in a bizarre statement. "Three options are being investigated, and whether the company is spun off, sold or kept in the HP portfolio, the team in the UK remains committed to creating and supporting great products and services." So despite saying it won't be getting out of the PC business, it still wants to get out of the PC business. Where is this all heading? Marshall reckons that "the PC isn't dead, but our relationship with it is changing: it's gone from white-hot tech to something more akin to white goods. When was the last time you got excited about a washing machine, or a kettle? That's where the PC is heading."